Before starting please realize that the walkthrough is based upon these characters, and as such your experience may be different than that which is described here. At the end of each section there is a summary of how hard it was to get through this area with each character described on the aforementioned sample build page. This is a summary as to how difficult I found it, and may not mirror everyone else's experience with the game. Also note that I always play at the highest difficulty setting for all characters. That said let us begin. Click here to see the Map of this Area, including a description of all container contents. You begin by being awakened on the Endar spire, which serves as a rather fast paced tutorial. One thing to note here is that there are no light or dark conversation choices that actually affect your alignment while on the Endar spire. In the first room go ahead and pick up your starting gear and equip it, after which you can exit the room by having Trask lead. You'll be gaining minor amounts of XP throughout the entire tutorial (150XP so far). On the way to the next door you will receive a transmission from Carth Onasi and the map will be revealed. Open the next door and you will face your first battle, a pair of Sith Soldiers! These guys are pathetically easy, and can usually be killed in 1 or 2 hits. If you get hurt, then Trask will automatically talk to you and give you an Advanced Medpac. Otherwise talk to him manually to have him hand it over. Always be sure to search for any loot that the enemies may have dropped. Also note that you cannot die (you have a minimum vitality of 1) as long as Trask is with you so there is absolutely no need to heal at all whatsoever, especially since you will be fully healed when you level up. Go over to the next room, kill the Sith and loot the containers. You should get a grenade at this time. Don't use it yet, you'll want to hang onto it for now. All of the enemies on board the Endar Spire are easy enough that you shouldn't have to resort to lobbing grenades. Also equip the armor that you find here, either on yourself or on Trask it doesn't matter. Make sure you loot these containers before proceeding, as you won't be able to return later. Proceed forward for a cut-scene. Usually I have Trask lead with a melee weapon here since he has way more vitality than you can have at this time. Wipe out this group of 5 Sith or so, and check the parts pile for a repair part. Proceed east and watch the Jedi Die. Make sure you loot her corpse after the Sith have died because she always drops a vibration cell, which will help a lot once you hit your first workbench. Enter the bridge and take out the two Sith, at which point the remainder should die in a big explosion. You will have enough experience to level up at this point. Do so and continue forward to a cut-scene. There is no need to unequip Trask before he leaves, as it is done automatically. After Trask is gone make your way to the Starboard section. Remember now that Trask has left you can die so use medpacs accordingly. It is actually to your advantage to use ranged attacks in this area, as most of the Sith here have a special blaster that only does 1 damage. If you move into melee range they will switch weapons to a conventional short sword or long sword, which will usually deal more damage to you. 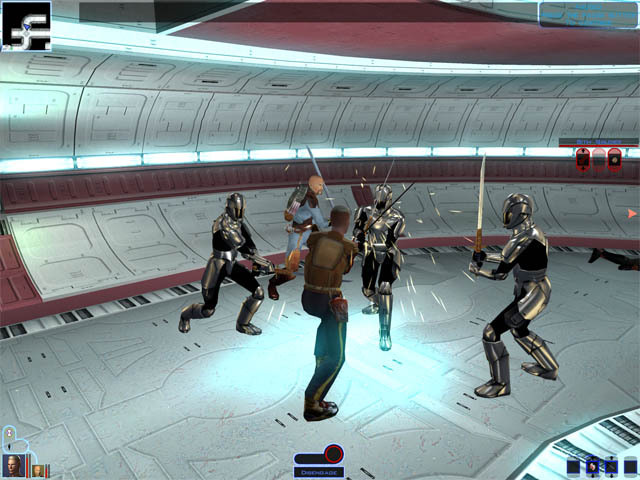 Once you enter this area Carth will contact you again, and if you have invested in the stealth skill you will be told to sneak past this next guy. If you do sneak forward enough (just past the two sith in the next room), you will gain a 300 XP bonus, which is nice, so I try to do that if possible. If scoundrels are not careful it is possible to die here, so make sure you don't get low on vitality. In the next room there are two Sith that you need to take care of so take them out. Loot them and the containers in here. Now you are faced with 3 different methods of taking out the Sith in the next room. The first way is to repair the robot. You get 30 xp for activating its shields and 100 xp for engaging its patrol route. You can choose not to activate its shields saving you some repair parts for later use. The second method is to slice the terminal and just fry the Sith for 150 xp. You will still gain the XP from their deaths so there is no need to be concerned about that. You can actually do both if you wish for extra XP. If decide to do both slice the terminal first to simplify things. Don't forget to loot the bodies in this room as the Sith Heavy Trooper will drop an ion blaster and a Prototype Vibroblade which will be your melee weapon of choice for much of Taris. The third and cheapest way can only be done if you have at least 8 points in security, as you are unable to bash through the locked doors. This means that you must invest 5 ranks in the Security skill as well as have a +3 Wis modifier. Personally I don't think that this is the best choice of skill distribution but it is a possibility. If you do have 8 points in security you can simply unlock the door and kill all of the soldiers yourself, but you may find that difficult to accomplish as a scoundrel without resorting to grenade lobbing. With those troopers out of the way you have successfully completed the tutorial. Go forward talk to Carth for 250XP and use the escape pod. Watch the FMV of you escaping to Taris and gain another 350XP. Soldiers: Extremely Easy. I didn't die once as a soldier and all enemies die in one or two rounds. Scouts: Very Easy. Same as above. I have yet to die during the tutorial as a scout. Some enemies may take a few more round than a soldier though. Scoundrels: Easy. I died once because I forgot to equip armor on them, and from bad luck (and I'm a cheapskate who tries not to use medpacs if possible). Otherwise it is quite easy. Overall: Very Easy. You should finish this area in 10 to 20 minutes or so.